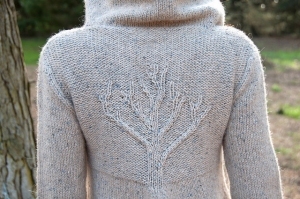 Taken from Botanical Knits 2: "This cozy sweater-coat features an A-line skirt, rounded back hemline, romantic oversized hood and secret tree motif only visible when the hood is worn. Bare Branches is worked in pieces from the bottom up and seamed together at the end." This pattern is from Botanical Knits 2, pg 34 - Bare Branches. Size US 8 - 32" circular needles, US 3 double point needles (or size needed to obtain gauge), a cable needle, three 1" buttons, stitch markers, stitch holders, and a tapestry needle are required but not included. Finished Bust Measurements: 34 (38, 42, 46, 50, 54, 58, 62)" after blocking. Gauge: 16 sts and 23 rows over 4". $168.35 -- Kit price including yarn only (no book or pattern). $194.25 -- Kit price including yarn only (no book or pattern). $207.20 -- Kit price including yarn only (no book or pattern). $220.15 -- Kit price including yarn only (no book or pattern). $233.10 -- Kit price including yarn only (no book or pattern). $259.00 -- Kit price including yarn only (no book or pattern). $271.95 -- Kit price including yarn only (no book or pattern). $297.85 -- Kit price including yarn only (no book or pattern).